Do you have kids ready to go back to school or a teen heading off to college and you have put off going shopping for everything they need ? K-mart has everything you need from school uniforms to everything your teen would want for their dorm room. While I was looking at Kmart.com, I noticed that they carry the French Toast brand of school uniforms which I have personally bought for my kids and really liked. I know first hand that if you have more than one child to prepare for back to school that it can get expensive. I noticed on Kmart.com that all items $199 and up you can qualify for no payments and no interest (see details)! What is even better is Kmart Bluelight specials ! 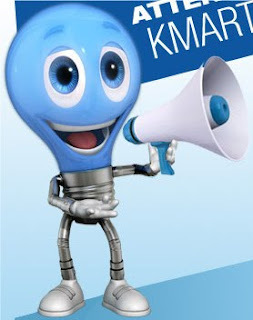 On Saturday 8/15 they will have over 40 great Bluelight Specials throughout the day in-store and also great offers will also be at Kmart.com only this Saturday! You will want to follow Kmart on Twitter to stay up to date with great deals. These great deals are not just for school items, you can also purchase patio furniture, grills, jewelry and more! Kids Backpacks (Athletech, Route 66 and Licensed) reg. $19.99 – Bluelight $8! I wish we had a Kmart near us! The closest one is an hour and a half away! I honestly don't even know if we have a Kmart near us, it's been YEARS since I've stepped foot in one. Would have been a great thing to head to, oh well I always miss the good stuff! I totally remember the Blue light specials-I know Kmart was about to go under at one point-Didn't Martha Stewart & Jaclyn Smith help save them?